Food for Thought: Several years ago the Port Hardy Rotary Club hosted a Rotary Youth Exchange student from Indonesia. Ray was a remarkable ‘peace ambassador’---wise beyond years, musically gifted, curious, and compassionate. At the conclusion of his wonderful year I asked him what he would always carry with him as he returned home. His response, “That is simple. It is the clean water from the tap, every day, for every person… and the freshness of the sea salt air every morning when I rise in Port Hardy”. Water! Yes, many have called it our world’s most precious resource. We have been gifted with a plentiful supply in North America. Yet is not only the water----we are to be thankful for ---- but the ‘clean’ water. We quite naturally take for granted that sanitation and water are partners in most of life experience. Global Grants Support Water and Sanitation Projects….. Each year Rotarians apply for global grants to help those less fortunate have greater access to clean water. The cisterns, the filtration and sanitation systems we sponsor, contribute to health and well being. Often these projects are often partnered with schools to deliberately draw students to schools and to safeguard their health. Clean water can bring the gift of life in so many ways. Sanitation can prevent disease. Clean water can fight polio. Last year, 1306 Rotary Global Grants were awarded totaling $86.7 million. 283 of these global grants were in the focus area of “Water and Sanitation”, second only in number to Disease Prevention and treatment. Through clean water and sanitation often come partners: improved child and maternal health, disease prevention, literacy gains, economic and community development…..and ultimately, I believe, peace and conflict prevention/resolution. 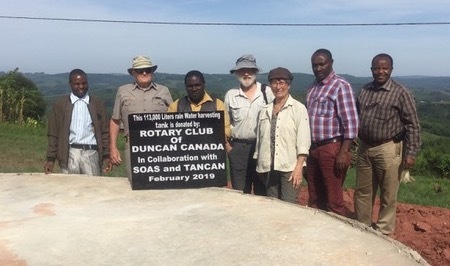 Our focus areas work together in so many ways….just as we as Rotarians work together to inspire and connect ----“We transform communities …..We transform ourselves”! Concluding Thought…. Please continue to support The Rotary Foundation. There is no greater gift that to know our privileged circumstances have given us the opportunity to contribute to projects that bring hope and possibility. My dream this year is to know that Every Rotarian in District 5020 has made a minimum donation of $25.00 (U.S.) to the Annual Fund or Polio Plus. I would be ecstatic to see us raise our District per capita contribution to $200.00 (U.S.). Know that our dollars help to fund District and Global initiatives----envisioned by you as Rotarians. Please take time soon at a club meeting to update progress to date towards your club Foundation goals. And now…..for a brief worldwide update…..for those who love numbers…..another edition of…. Rotary by the Numbers ---- How is our Rotary populations distributed throughout the world? As always, I thank you sincerely for taking time to read or to share this bulletin. And thank you for continuing to believe in the goals that we as Rotarians are able to set and to achieve. I hope to see you register for our District Training and Conference so that we can learn and we can celebrate with our family of Rotary-----together!